On Thursday, June 14, 2018, Michigan EIBC held its third of five electric vehicle (EV) convenings at the Michigan Agency for Energy’s office in Lansing. The meeting – attended by leaders in mobility and energy storage, state regulators, and other interested parties – focused on DC fast charging, long-dwell charging, and charging infrastructure deployment. Michigan EIBC president Liesl Eichler Clark kicked off the meeting with an overview of Michigan’s progress on vehicle electrification, including the Michigan Public Service Commission’s EV Technical Conferences, the Institute for Energy Innovation’s MEC4: Powering Mobility Conference and release of the “Powering the Mobility Revolution” report, and Michigan EIBC’s first two EV convenings. Next, Jeff Mason, CEO of the Michigan Economic Development Corporation, shared that EV deployment is expected to be 30% worldwide with 36 million vehicles by 2040 and that Michigan’s aim is to be front and center. Mason said the convergence of energy and mobility is an important strategic point for Michigan to solve correctly. Michigan needs to invest in adequate charging infrastructure to support consumer adoption, Mason argued. Mason pointed out that Michigan is in a unique position due to the strength of the vehicle and battery industry, including important development in supporting markets like electrolytes, cathodes and more. By 2040, Merrill Lynch data expects EVs to be cheaper than ICEs. 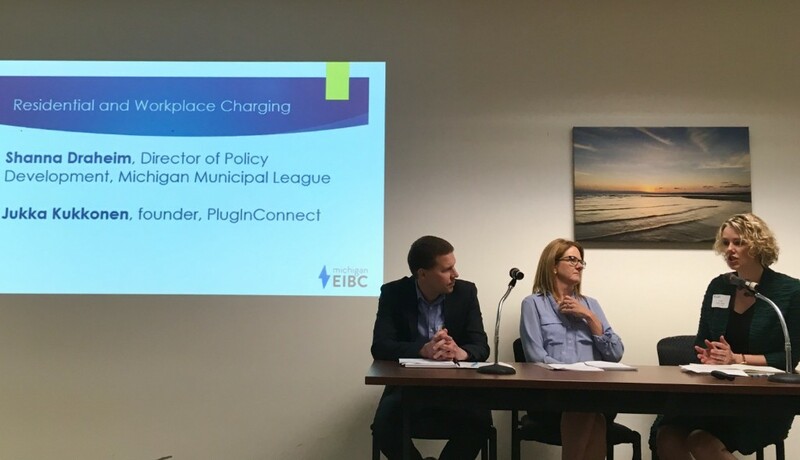 Next, Shanna Draheim, Director of Policy Development for the Michigan Municipal League, and Jukka Kukkonen, founder of PlugInConnect, spoke on a panel about residential and workplace charging. Draheim explained that investing in advanced mobility, vehicle electrification and EV charging can make communities more attractive to potential residents and businesses. Kukkonen discussed that the best way for utilities to create a sound environment for EVs is to look at the bigger picture and understand the needs of building owners and other stakeholders. He described several common utility EV programs, including time-of-use rates and hourly pricing, charging infrastructure incentives, controlled charging programs such as load sharing and smart charging, and workplace, apartment and condo charging programs. Ultimately, Kukkonen argued that utilities should spend more time and money investing in apartment and condominium charging programs, because the ability to charge at home can make a significant impact for multi-unit dwelling residents. Finally, he emphasized that utilities need to be ready to adjust their programs as markets change. 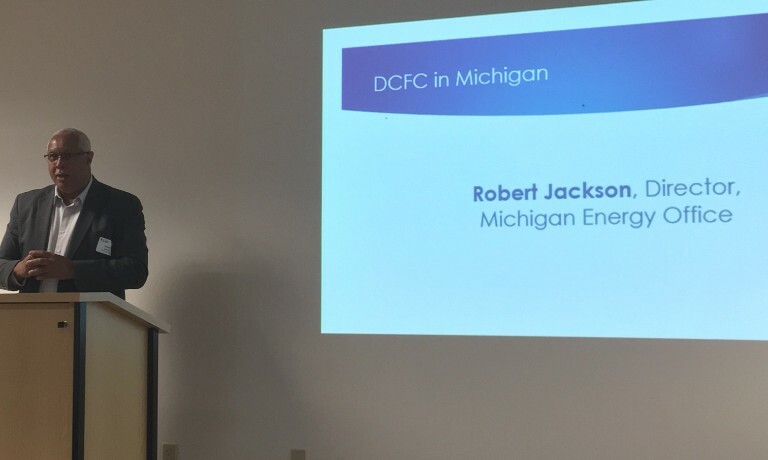 After the panel on residential and workplace charging, Robert Jackson, Director of the Michigan Agency for Energy (MAE), discussed ways to set the stage for DC fast charging in Michigan. MAE leads the strategic development for the Michigan Volkswagen settlement funds and has commissioned a study by Michigan State University to assess the optimal locations for highway DCFCs in Michigan. Next, MPSC Commissioner Norm Saari moderated a panel on accelerating DCFC deployment in Michigan, with Marcy Bauer, Director of Program Operations for EVGo and Sophie Shulman, Business Development and Partnerships Manager for Electrify America, as panelists. Bauer touched on the importance of giving new EV drivers, especially renters and test drivers, positive first DCFC experiences to help break down barriers for the next level of EV adoption. She emphasized that customers’ DCFC experiences need to not only be convenient and easy, but fast. Shulman noted that the primary barriers to EV adoption are lack of charging infrastructure, slow charging speeds, and lack of customer awareness. She emphasized the importance of having accessible and visible DCFC stations along the highway, having multiple chargers at each station to account for maintenance issues and queuing, and partnering with businesses to give customers something to do while their car is charging. Matt Stanberry with Advanced Energy Economy closed the 3rd EV Convening by highlighting issues for participants to continue to think about, including policies around multi-unit dwellings, ways to build additional public-private partnerships, ways to build flexible and adaptable technology, and the importance of DCFC deployment and partnerships to enable EV adoption. The fourth EV Convening, which will cover fleet deployment, is scheduled for July 18 at the Michigan Agency for Energy’s office in Lansing. Interested parties can register here. Summaries of the first, second, and fourth EV Convenings are available as well.